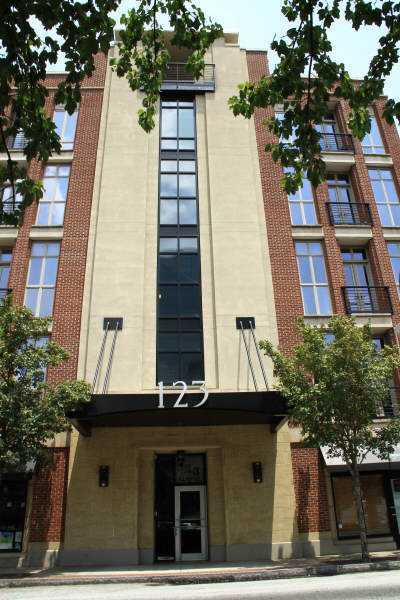 123 Luckie is an Atlanta loft complex located in the Fairlie-Poplar district of Downtown Atlanta. Built in 2000 and consisting of only 49 units in two buildings, 123 Luckie was winner of the 2001 American Institue of Architects' Urban Design award. This contemporary loft complex is ideally positioned, walking distance from events an entertainment at venues as varied as The Tabernacle, Phillips Area, Georgia World Congress Center and the Georgia Dome. A truly walkable location, 123 Luckie is straddled by two parks, Centennial Olympic Park to the west and the smaller Woodruff Park to the east, and the area boats dozens of dining opportunities within close proximity. Amenities include covered, assigned parking, rooftop deck, outdoor courtyard and more. Below you'll find the latest 123 Luckie loft units for sale.